It's common to think of trees as either deciduous or coniferous, but there is a third category that takes on characteristics of both. These "deciduous conifers" are not plentiful, though they are quite interesting. If you're looking to plant a tree with needles that also provides amazing crimson or gold fall color, a deciduous conifer is the answer. Most trees and shrubs fall into one of two categories: deciduous or coniferous. Deciduous trees have leaves that fall off yearly. Coniferous trees have needles or scales that do not fall off. Another common name for conifers is evergreens, although not all evergreens are conifers because some tropical trees and shrubs do not change with the seasons. There are about 20 species of trees that straddle both worlds and are dubbed deciduous conifers. These trees form cones and sprout needles like conifer trees. Yet, they change colors in the fall and lose their needles every year like deciduous trees. The needles of deciduous conifers may look like evergreen needles from a distance, but they are much softer than the familiar pointy needles of pine trees, for example. Deciduous conifer trees are not as readily available as most common tree species, but they are sold at many nurseries. The most common types of deciduous conifers include European larch, tamarack larch, bald cypress, and dawn redwood. Most of the deciduous conifers belong to the genus Larix and are commonly known as larch trees. These trees have short needles in clusters that run along the branches, with flowers sprinkled throughout. The flowers transform into cones. Larch trees are appealing because they look like spruce trees in summer but stand out in autumn, when their needles display stunning new colors. Many varieties of the larch grow quite tall, with most reaching 50 to 80 feet at maturity. The European larch, tamarack larch, and western larch are among the largest. Though much less common, it is possible to find dwarf species of larch, which can reach maximum heights of just 8 feet. You can also find larch that spread out rather than grow tall, making nice shrubbery. If you have the space for these big trees, you'll be happy to know that a larch is easy to grow. Many thrive in cold climates and enjoy full sun, and they tend to require very little care. They do not like dry soil, but most can tolerate a random drought. Dauhurian larch (Larix gmelinii): A 40- to 90-foot tree with a spread of 15 to 30 feet, the bright green needles of this larch turn yellow in fall. European larch (Larix decidua): A popular species, European larch can max out at a height of 100 feet with a 20- to 30-foot spread. It has the pyramid shape of most larch but becomes more irregular as it ages. The golden yellow fall foliage is especially attractive. Himalayan or Sikkim larch (Larix griffithii): This tree tends to grow in an oval-pyramid shape and can easily reach 65 feet in height. Native to the Himalayas, its needles get a bright yellow color in fall. Japanese larch (Larix kaempferi): Another yellow larch in autumn, this species reaches 70 to 90 feet in height with a spread of 25 to 40 feet. As indicated by the common name, it is native to Japan. Kongbo larch (Larix kongboensis): Native to Tibet, this can be a smaller tree with a height of 30 to 80 feet. In fall, the leaves have a red color. Langtang larch (Larix himalaica): This Nepal native is also sometimes classified as Larix potaninii var. himalaica. It thrives at high elevations and is known to live in valleys near Mount Everest. Masters' larch (Larix mastersiana): Native to China, this larch can reach 80 feet in height and is hardy to USDA plant hardiness zone 7. Olga Bay larch (Larix olgensis): This is also sometimes classified as Larix gmelinii var. olgensis. It grows to heights of 40 to 90 feet with a spread of 15 to 30 feet. This larch is showy, with brilliant yellow fall foliage. Potanin's or Chinese larch (Larix potaninii): A very large larch, this species can easily reach over 100 feet tall. It is native to Nepal and turns a bright orange in autumn. Prince Rupprecht's larch (Larix principis-rupprechtii): A relatively small larch, this tree is native to China and Korea and reaches heights of only 40 to 60 feet. Its spread is 15 to 30 feet, and in the fall it turns a very bright yellow. Siberian larch (Larix sibirica): This larch also goes by the name Larix sukaczewii. A massive tree, it can reach heights of 80 to 200 feet. Its light green needles turn a bright yellow in autumn. Subalpine larch (Larix lyallii): A native of Canada and northern parts of the western U.S., this larch turns a golden yellow in fall. It typically grows to 80 feet. Tamarack larch (Larix laricina): Tamarack larch grows 40 to 80 feet tall and 30 to 50 feet wide. It is native to northern Minnesota and Canada and displays a brilliant orange-yellow color in autumn. Western larch (Larix occidentalis): Also known as the western tamarack or mountain larch, this large larch is found in the northwestern mountains of the U.S. The tree can easily reach 150 feet in height. In autumn, it turns the mountainsides a bright yellow. Yunnan larch (Larix speciosa): A variant of the Sikkim larch, this tree is also known as Larix griffithii var. speciosa. It is native to China and can reach 65 feet tall. It also turns bright yellow in fall. Hybrids are also common within larch trees. 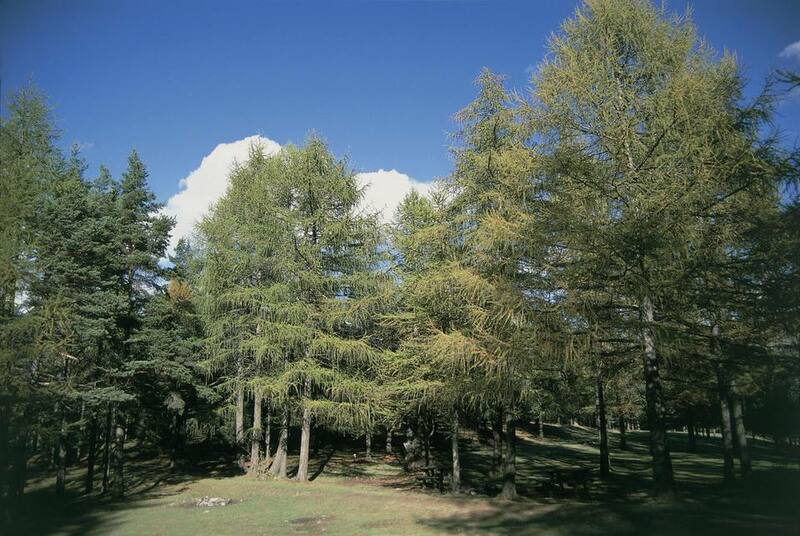 The Dunkeld larch or hybrid larch (Larix x marschlinsii), for example, is a hybrid of Larix decidua × Larix kaempferi. A number of other hybrids exist that take the most desirable characteristics from each of the parent trees. The larch is not your only option for deciduous conifers. Some cypress trees and a few other species also fall into this category. The bald cypress and dawn redwood are two favorites for landscape design. Bald cypress (Taxodium distichum): Native to the swamps and bayous of the southeastern U.S., this tree has feathery needles that turn coppery red in fall. It grows 50 to 70 feet tall​ but can reach over 100 feet. It spreads 20 to 30 feet wide on average. Chinese swamp cypress (Glyptostrobus pensilis): A native of Southeast Asia, this tree is now endangered in the area. It doesn't tolerate cold and is best in USDA zones 9 through 11. At maturity, it can reach 60 to 90 feet in height and have a spread of 40 to 60 feet. The leaves get a reddish-brown color in fall. Dawn redwood (Metasequoia glyptostroboides): The Dawn redwood has very fine, feathery needles that turn a brilliant bronze color in the fall. It can reach 70 to 100 feet tall and spread to 15 to 25 wide. Golden larch (Pseudolarix amabilis): This is not a true larch because it is not in the Larix genus. It originated in China and reaches 30 to 60 feet in height, with a 20- to 40-foot spread. In fall, it turns a beautiful golden yellow. Pond cypress (Taxodium ascendens): A fast grower, this is a popular landscape tree for ponds and swampy areas. It reaches 45 to 60 feet in height and has a width of 15 to 20 feet. The foliage turns a deep coppery orange in autumn.